Greetings from the Sand Dunes! The weather in Yanbu is still pleasant—around 83°-85° during the day with 64°-68° at night and the humidity anywhere from 35% to 65%. It is definitely a big difference from Sarasota humidity at 90% -100%. Since the temperature should be in the mid 90’s by now, we are accepting the warm weather with great appreciation. Our home has become more personalized using sari prints to make valances and pillow coverings in the living and dining rooms and the den. Most of the plants outside are the same as those that I have in my Florida yard and they continue to thrive and bloom. There was a huge, week-long flower show at the corniche with 3 million planted flowers in all. They are still there, however as the sun becomes stronger, the carpets of flowers are thinning. In one area 1.5 million plants in swirls of color made a gorgeous carpet of color. It was an enormous show and fair complete with an all male marching drum parade. They danced and sang through the middle of the fair then up the stairs onto a stage to sing and play music every evening. Around 10:00 p.m. fireworks began over the water spraying color and sparks over the entire skyline. 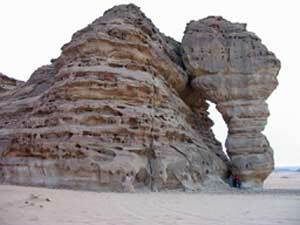 Recently a bus trip was arranged to Madain Saleh. What was hoped to be one busload became two busloads filled to capacity. After approximately five hours of traveling north along the coastal highway, we wound up into the mountains for another two hours finally arriving at Al Ula and our hotel. In typical Arab and Saudi fashion we were warmly greeted upon arrival. After their initial surprise to see so many people pouring off the buses into the hotel lobby, we were served traditional Arab cardamom coffee and dates. 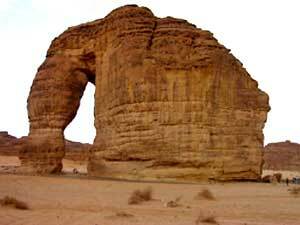 Madain Saleh is about 22 kilometers north of Al Ula. This area was once the largest and most important center of civilization located on a major trade route. During the early Islamic period it became an important pilgrimage station for Syrians and Egyptians traveling to Medinah and onward to Makkah. The Nabataean tribes lived and flourished in this area in approximately 500 B.C. This was their southern capital, while Petra in Jordan was their northern capital. 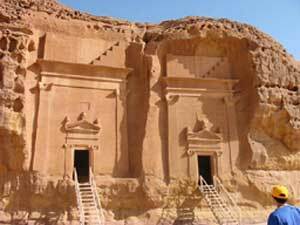 The openings to the tombs have massive facades decorated with eagles, sphinxes and serpents with over 150 tombs carved inside the rocks. As we approached the antiquities site of Madain Saleh, we were stopped at a check-point near the site. A list with all our names was given to the guard who then boarded both buses and took a head count. After the buses were inspected including mirrors checking underneath, we were allowed to proceed to the tombs with a couple security guards following and watching us in their jeep. When we lived here before, the Saudi’s preferred that we see everything that was new! Now, they are very concerned and want to preserve their past—and what a colorful history dating back to the Garden of Eden. The rocks are so beautiful, etched with erosion from water and wind. 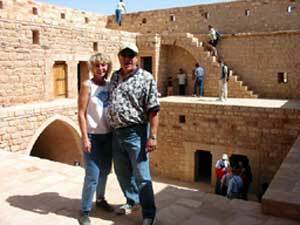 There were several wells built by the ancient Nabataean tribes. By carving into the rocks they made a road for rainwater to wind around the mountains into deep wells that they dug. The Hejaz Railway, built between 1900-1908, followed the ancient trade route from Damascus to Madinah. Although it was supposedly built to transport pilgrims to Mecca and Medinah, its main purpose was to facilitate troop movement especially during WWI. Around the station were garrisons and rest stations for those traveling the route whether by camel or by train. During WWI , those using the railway system or traveling by camel were afraid of thieves stealing their gold and other valuables. Chests filled with treasures were buried within and around the train stations. The railway system was destroyed around 1916 during the Arab Revolt against the Turks. 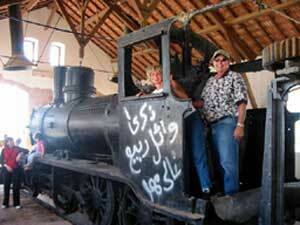 The station at Madain Saleh has been restored and houses an old steam engine locomotive from that era. The water towers and garrisons still remain every 20 km along the line. We also explored the station in Al Ula where huge holes remain throughout the station showing the evidence of treasure hunters. In Al-Ula we also visited the Mud Village. It was given its name because the complete village was built with mud and tree branches. It was destroyed by a great fire and never rebuilt. 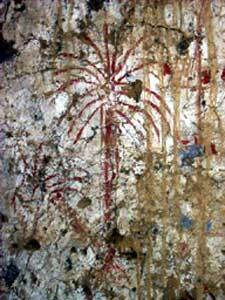 In exploring the village houses, we found drawings on walls showing palm trees and the typical Arabian coffee pot. It reminded us of the caves discovered in Spain and France from the caveman era where drawings of everyday life were drawn on the walls. Throughout our trip we would see camels, goats and lambs, however at one point the camels were closer to the roadway and the bus drivers stopped for us to see. The camel herder brought one saddled camel closer for us to see and sit on it for pictures. Even if it was actually prearranged it was fun. We then went on to a farm and had coffee, tea and dates. It was actually cool under all the palms and fruit trees. There were baby camels, goats and lambs for everyone to pet and they certainly amused not only the children, but all us adults as well. Besides the tombs we went further into the desert and saw incredible rock formations including mammoth rock (elephant rock and what I call baby elephant rock). Before we were to return to Yanbu we had a buffet luncheon in the desert served in the shade of one of the rocks. It certainly was an exciting as well as an educational experience and at a time of the year before the very hot weather. The Women’s Group has a monthly coffee, cooking demonstration and monthly luncheon at the Radisson Hotel. The cooking demonstration this month will be a Filipino noodle dinner. Last month there was also a stained-glass demonstration. The group also has a monthly newsletter, and a vacancy for the editor which I have now undertaken. A few ladies wanted to bowl and we now go to the Holiday Inn (yes, just like Holiday Inn in the U.S.) where they have lanes for bowling. It is a package that was set up for us where we are picked-up by bus, served breakfast, bowl and retuned to our homes.